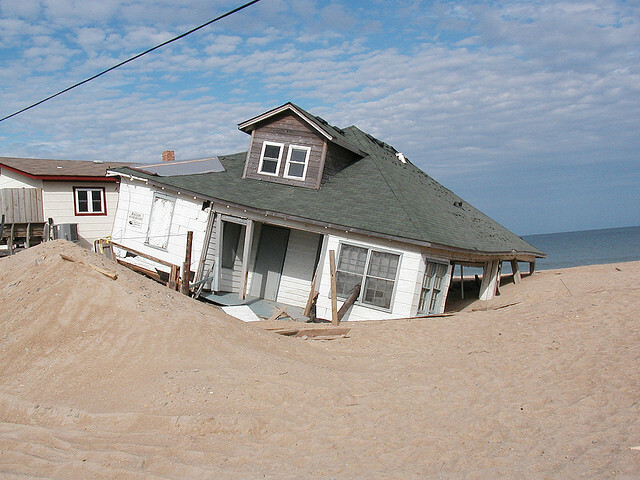 Superstorm Sandy came ashore in New Jersey on October 29th, 2012. The storm caused 109 fatalities in the US and more than $71 billion in damage and lost business income. 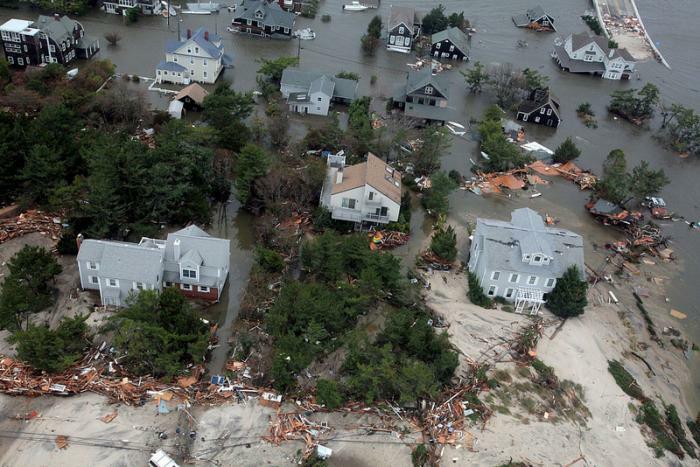 The destruction caused by a combination of wind, flooding, and storm surge was focused in New Jersey and New York City. An extremely large area hundreds of kilometers across received extensive damage. Half of the city of Hoboken flooded, a 50-ft segment of the Atlantic City boardwalk washed away and hundreds of beachfront properties all over the New Jersey shore were damaged or destroyed. In New York City, the East River flooded its banks in lower Manhattan and the subway system suffered its worst flooding in history. A storm surge of almost 14ft flooded Battery Park and a 16ft surge hit Staten Island, where damage and casualties were particularly severe. However, lost in the discussion about the causes and impacts of the storm is this: scientists have known for a long time that the New York City region is very vulnerable to storm damage. Sandy has reinvigorated the debate about hurricanes and climate change (see Module 3). Remember, climate change is supposed to result in larger storms, not necessarily more frequent storms, although there is still lack of agreement among scientists in this forecast. The basic problem is that unlike temperature and precipitation, where we have massive amounts of data to see trends, run models and make projections, we have very few large storms to accurately forecast. Nevertheless, the amount of heat in the North Atlantic Ocean in October 2012, is a strong, if not irrefutable argument for a relationship between Sandy and climate change. And the interaction between a hurricane very late in the season for the northeast coast and a cold front more typical of that time of year was what made Sandy so large and so deadly as well as steering indirectly towards the coast. The discussion about Sandy and climate change is bound to continue for a long time. However, we know for certain that global sea level is 1.5 ft higher than when New York City was hit by a storm of a comparable size in 1821, the massive Norfolk and Long Island Hurricane, and that extra foot plus made a huge difference in Lower Manhattan. Ten percent of the world's population, or approximately 600 million people, live on land that is within 10 meters of sea level. This low elevation coastal zone includes some of the world's most populous cities besides New York, including London, Miami, Calcutta, Tokyo, and Cairo. In the US, the situation is most dire in New Orleans where a large portion of the city lies below sea level making the city highly vulnerable to storms such as Hurricane Katrina. New Orleans is in an especially precarious positions because the land on which it is built is subsiding rapidly, at a rate far faster than modern sea level rise, as a result of development of marshlands, and major decisions will need to be made in the future on whether to keep investing in infrastructure to keep the seas out or whether to retreat from low-lying areas. 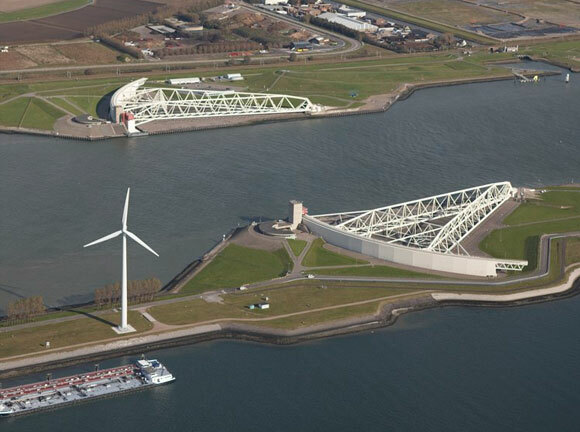 Such investment has already been made in the Netherlands where a massive system of flood protection has been developed to keep the oceans at bay. 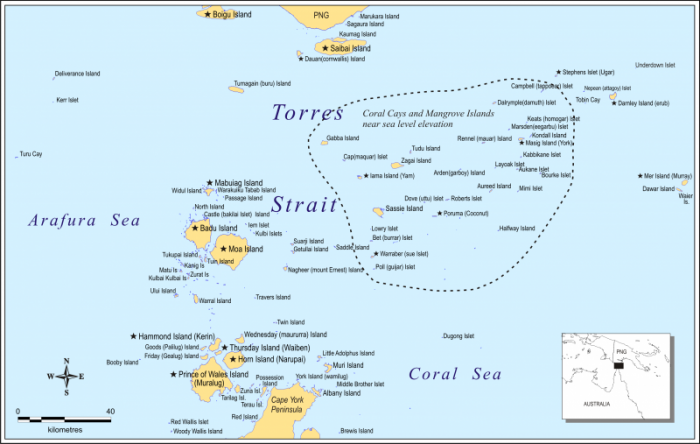 However, tiny island nations in the Pacific and Indian Oceans that are within a meter's elevation of sea level do not have the resources available to protect the land from rising seas, and these nations are grappling with the distinct possibility that they will be completely submerged by the middle part of the century. Average global sea level has risen about 17 cm since 1900 with considerable variability from place to place. The average global rate of sea level rise is about 3 mm per year, but in parts of the western Pacific, this rate is closer to 1cm per year. New techniques enable extremely precise measurements of sea level, and this has allowed geoscientists to determine the vulnerability of different places to future sea level rise. As we have observed in Module 2, the large ice sheets of the world are melting at rapid rates. In fact, the Intergovernmental Panel on Climate Change predicts that sea level will rise by up to an additional 0.6 m by the year 2100 (see adjacent plot), although a great deal of uncertainty is associated with the unpredictability of ice sheet behavior combined with different emissions scenarios and warming trends. In fact, if we go back 125,000 years before present to the last interglacial period, much of Greenland was ice-free and sea level was 4-6 meters above present. However, this amount is dwarfed by the sea level changes that have taken place in deep geologic time. For example, about 90 million years ago, sea level was hundreds of meters higher than today, and the ocean extended across the North American continent connecting the Gulf of Mexico to the Arctic Ocean. The stakes are huge. 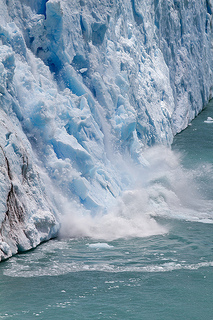 Recent data suggests that melting of the Greenland Ice sheet is accelerating. Imagine the consequences of this process should it continue for decades to come. Just one number should make the point clearly. A seawall which is being discussed to protect New York City and parts of New Jersey from future Sandys will cost about $23 billion. Imagine what it would cost to protect Boston, Philadelphia, Washington DC, Miami, Houston, Los Angeles, and San Francisco! 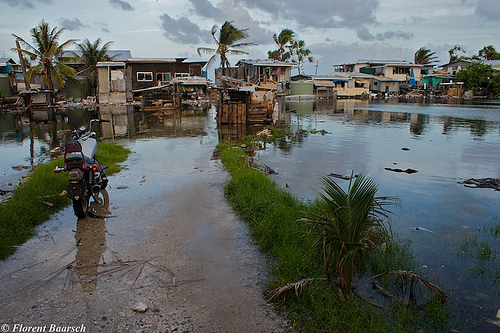 propose strategies to cope with rising seas in communities that are most threatened by sea level rise. 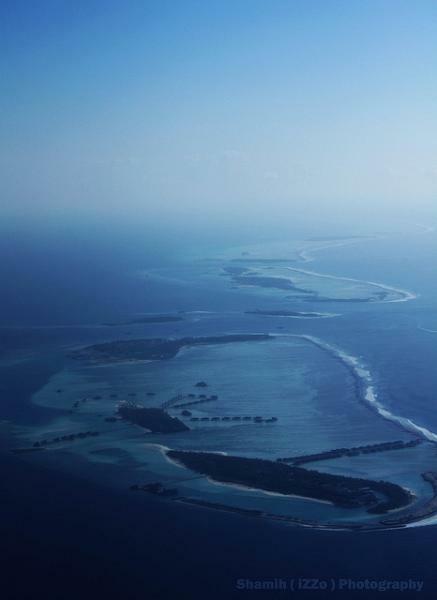 How much is sea level forecasted to rise in 2100? What are the processes that are causing modern sea level rise and what is the relative role of each? How much would sea level rise if all of the ice on Greenland and Antarctica were to melt? 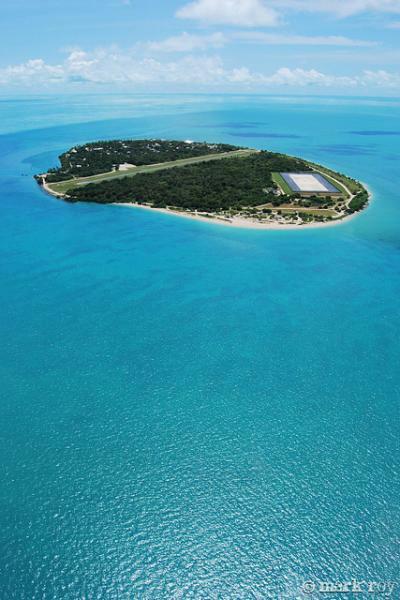 What is the current rate of sea level rise? 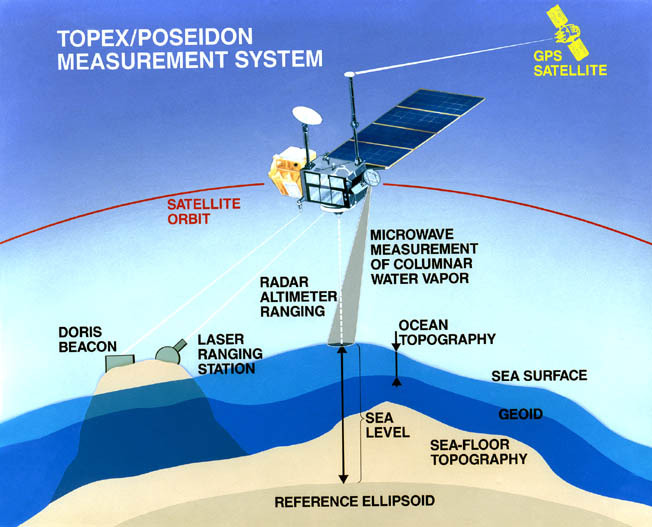 What instruments are used to measure modern sea level rise? 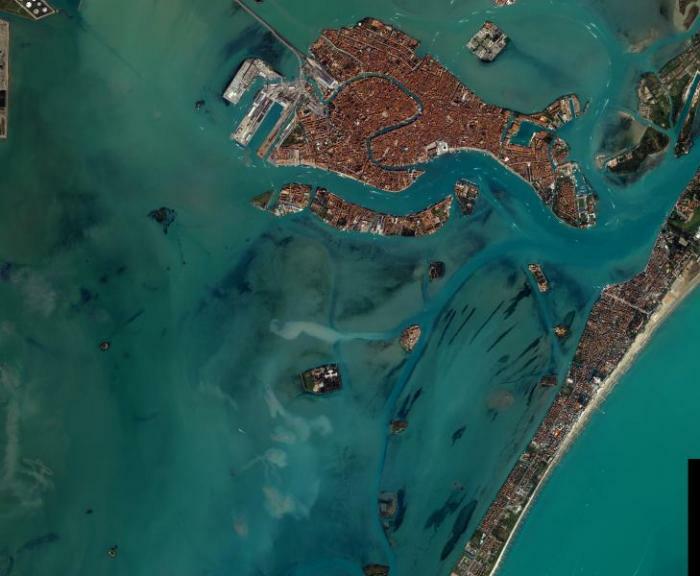 What faunas can be used to reconstruct ancient (but fairly recent) sea levels? 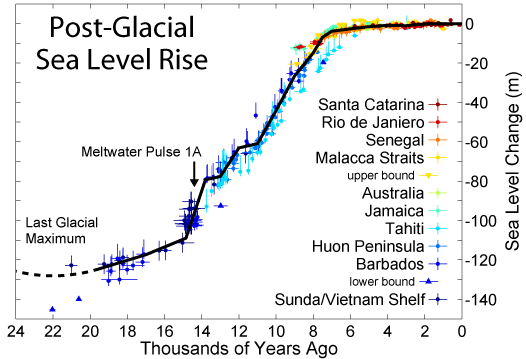 When in the last 25 thousand years were the fastest rates of sea level rise? 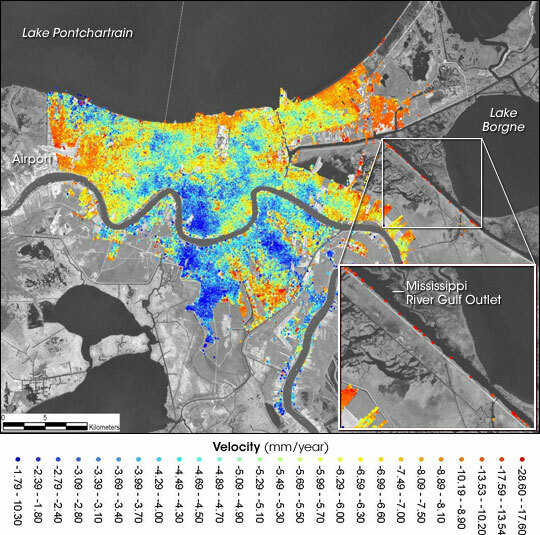 What are some of the processes that are causing relative sea level change in the region around New Orleans, and how much are some parts of the city subsiding? What do the terms transgression, regression, and sequence refer to and how do they fit into the concept of relative sea level change? 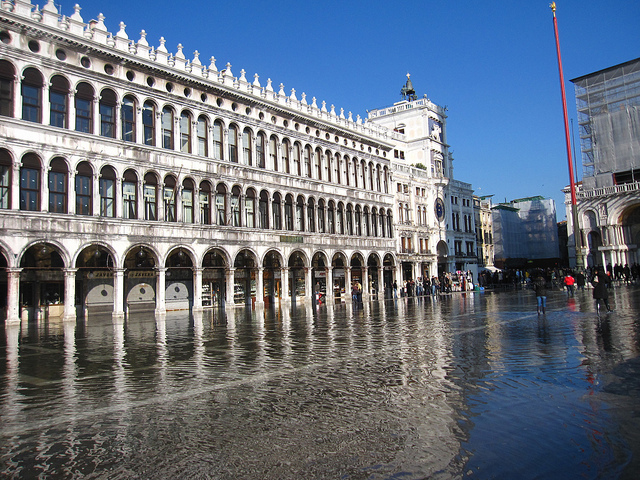 What is reflection seismology and how does it help determine ancient sea level? Why was sea level so high in the Cretaceous and Eocene? What is storm surge, and why did it do so much damage during Katrina? 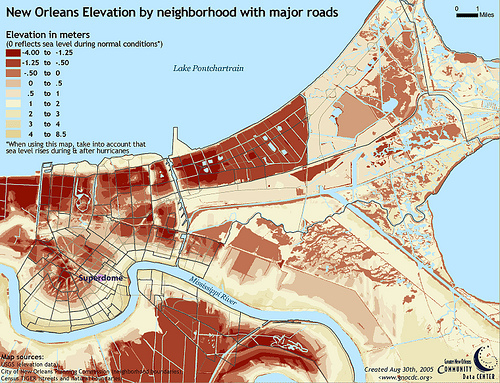 What strategies are being used to prevent flooding in the next Katrina? 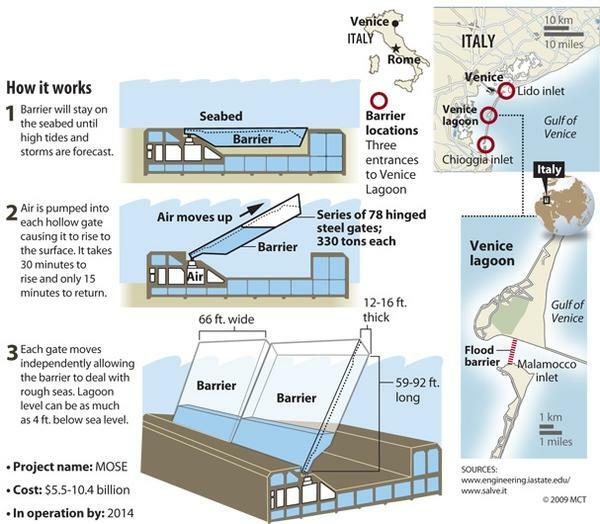 What strategies are being used to prevent flooding on the Outer Banks, Netherlands, and Venice? 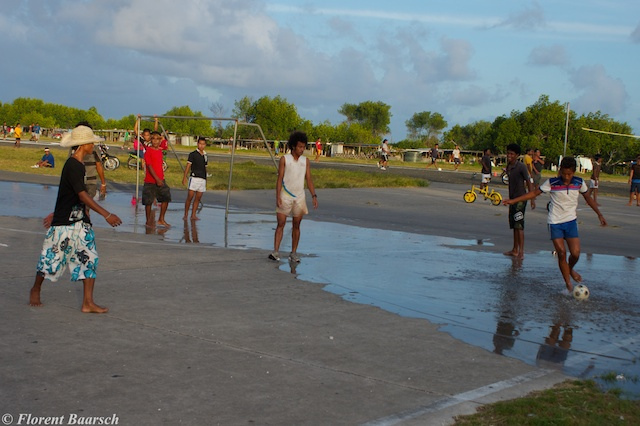 What is the future of sea level rise in Bangladesh, Pacific Islands, and the Torres Straits? 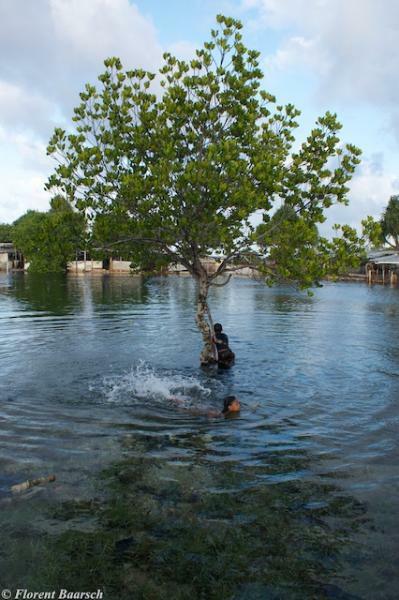 In this section we explore current and future challenges posed by sea level rise. Our example case studies come from the developed and developing world. We will see that there will be a very different range of options in countries with ample resources from those without. Let us assume that by 2100 sea level will rise by amounts similar to the upper bounds of the 2007 IPCC estimates, roughly 60 cm. At the same time, let's assume that subsidence rates on the New Orleans region continue at current rates between 2 and 28 mm/year. The result would be between 0.8 and 3.1m of sea level rise relative to the current land surface. 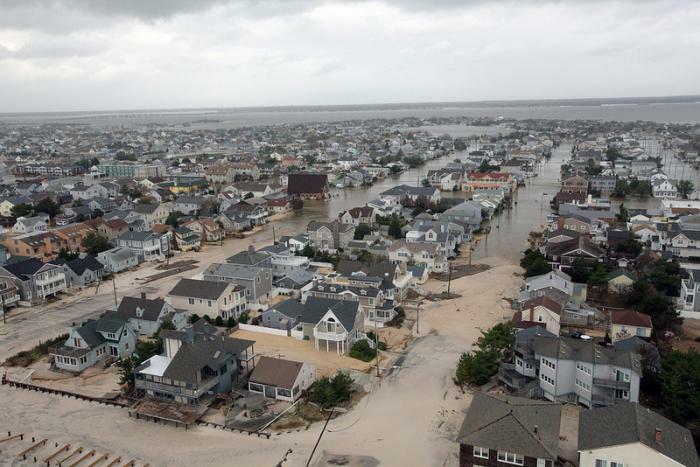 Even if sea level rise does not inundate low-lying coastal regions, it will make them more prone to flooding during storms and prolonged periods of heavy rainfall. In fact, this is the predominant fear in places like Bangladesh and the Mississippi Delta region near New Orleans. Let's consider the area around New Orleans where hurricanes are a constant threat. The extensive damage caused by Hurricane Katrina did not arise from wind or rain, rather the massive storm surge, the giant wall of water that was pushed up onto the land during the hurricane. This storm surge was over 9 meters to the northeast of the city and peaked at about 5 meters within the city limits. This water either overtopped the levees and flood walls that were built to protect low-lying areas of the city, or, more frequently, combined with the wave action to topple levees from the base upwards. In the aftermath of Katrina, the Army Corps of Engineers has rebuilt the levee and floodwall system in New Orleans, and upgraded pump stations, to defend the city from a similar storm surge in the future. The new system offers multiple lines of defense beginning outside of the perimeter of the city. The massive Inner Harbor Navigation Canal Lake Borgne Surge Barrier is the largest flooding structure in the US. The following videos describe how subsidence is leading to sea level rise in the Mississippi Delta region and how engineering is being used to combat it. The earth is undergoing dramatic change over its geologic history. 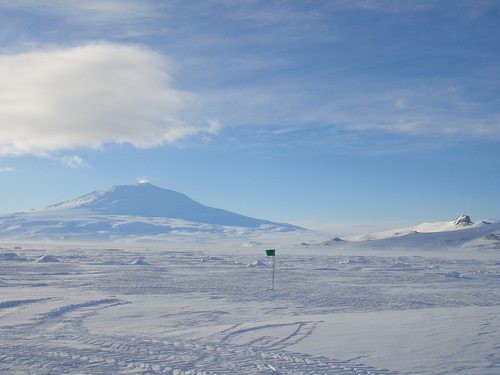 As the earth is cooled and warmed, ice fields have advanced and receded. During warming periods, ice melts and water expands, causing sea-level rise. 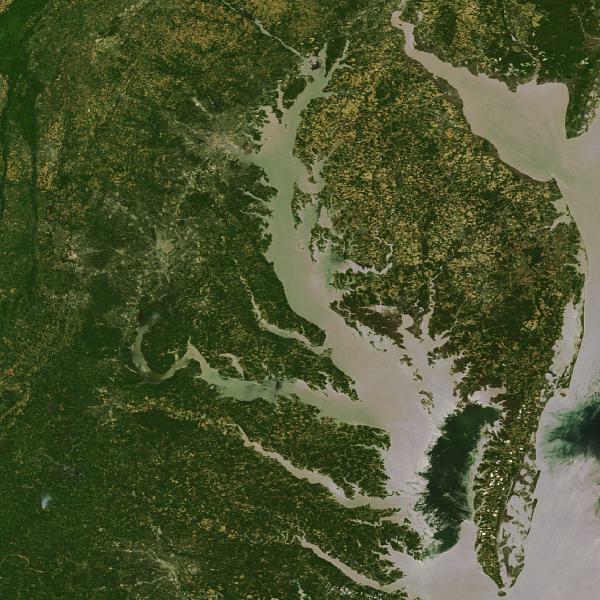 Scientists are studying how sea-level rise may affect coastal wetlands. A key study site is the Mississippi River Delta, which is experiencing high rates of relative sea-level rise due to rapid land subsidence. Subsidence is the process of sinking to a lower level. Sediment deposited by the river undergo subsidence due to compaction and dewatering. As water and gases are squeezed out of spaces between soil particles, soft sediment compacts. 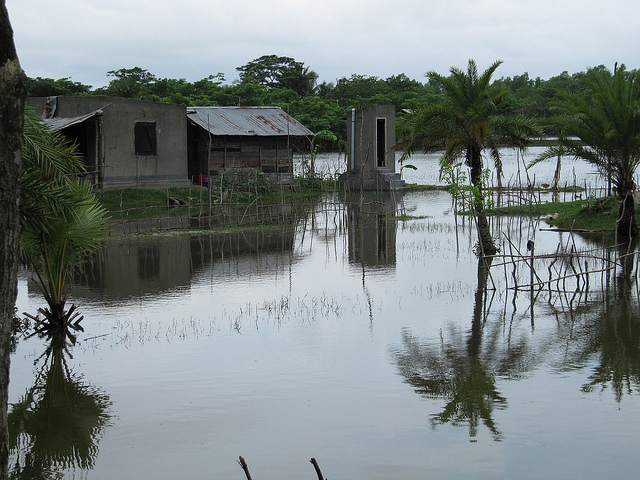 As the sediment compacts, subsidence occurs and the land gradually sinks. Buildings and other structures also sink along with the soil surface. 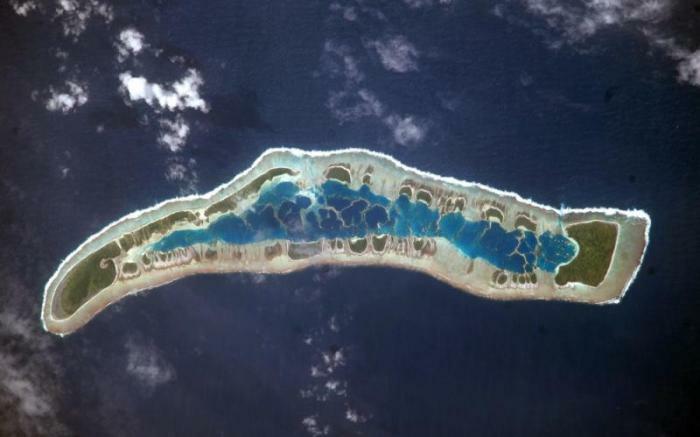 The other process contributing to land loss is sea-level rise. 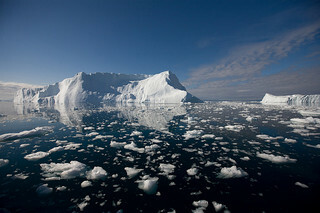 As global temperatures rise and land-based ice melts, oceans expand. As ocean volume expands, sea level rises globally. This is known as eustatic sea-level rise. Relative sea-level rise is the combination of eustatic rise in sea level and land movement and is unique for each location. The combination of the two processes determines the rate of submergence in each coastal area. The Louisiana coast is a dynamic system, built in part by the action of the Mississippi River. To understand how subsidence affects the Mississippi River Delta and its wetlands, we first have to go back a few thousand years. Because glaciers were melting 8,000 years ago, sea levels were higher at that time so much of the present-day coast was underwater. Where New Orleans is located today was also under the sea. Sea level continued rising, forming a bay that would ultimately become Lake Pontchartrain. 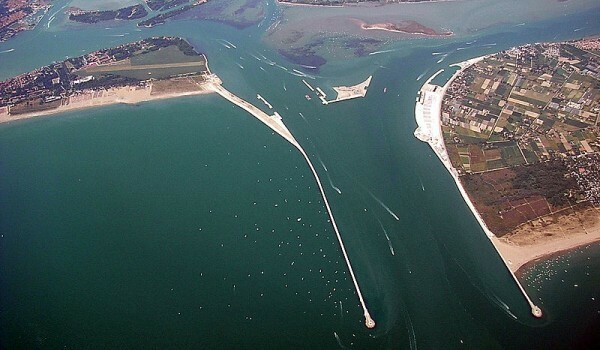 Sea-level rise then slowed and the river began building up sediments along the coast. Scientists call these deposits Delta lobes. 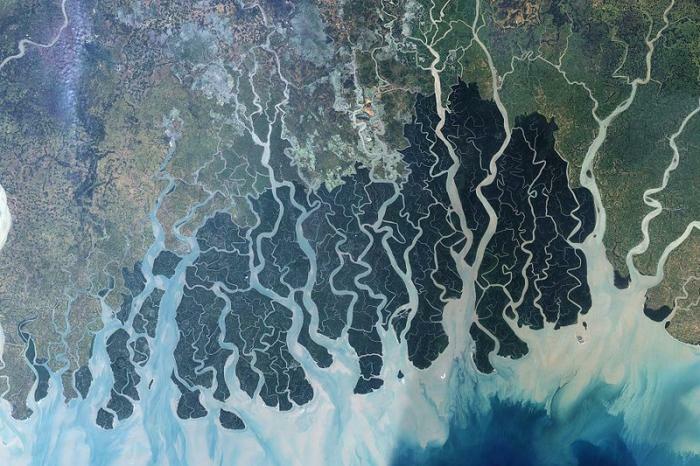 Additional Delta lobes were formed as the river switched from east to west and back again. When the river switched to a new course, the abandoned lobe began to deteriorate, a process that caused formation of barrier islands. The last area to form is what is now the modern Delta. This cycle of land building, followed by deterioration and rebuilding, is a natural part of the Delta cycle which has created a vast expanse of marshes, swamps, and barrier islands. The river periodically overflowed its banks each spring, delivering sediments to the coastal marshes and swamps. Then Europeans arrived on the scene and established New Orleans in a bend of the Mississippi River. To prevent flooding of New Orleans, levees were built and these were extended as the city grew. Then in the 1920s, there were catastrophic floods, such as the great flood of 1927. 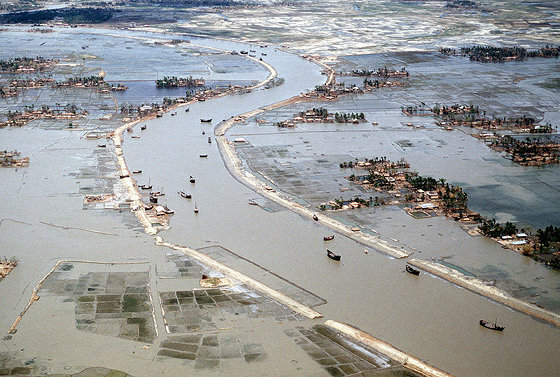 Disastrous flooding prompted the construction of levees which eventually extended the entire length of the lower part of the river. 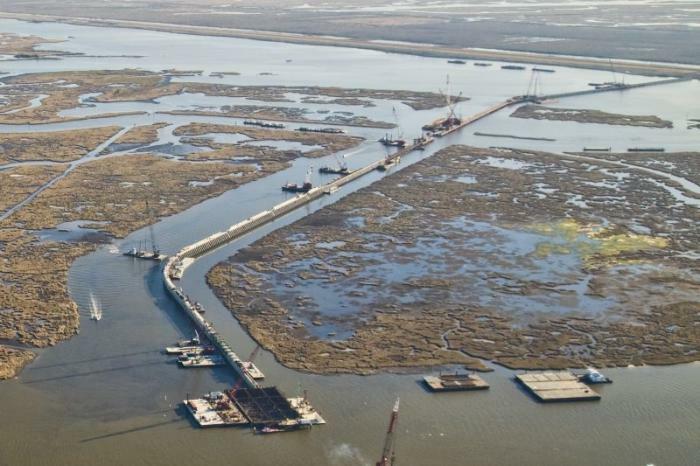 Levees prevented natural sediment delivery to the wetlands in the Delta. Instead ,sediment was shunted offshore into deep water and the wetlands sitting atop, compacting sediment, began deteriorating. Scientists attribute a portion of wetland loss to direct and indirect effects of canals, which were built for navigation as well as for access to oil and gas wells. Material was dredged from the wetland and deposited in spoil banks along the canals. 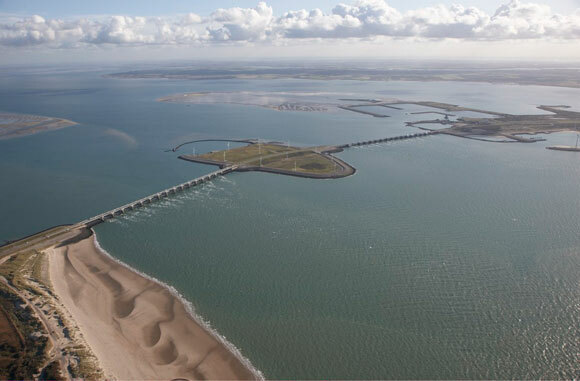 These spoil banks acted like levees blocking natural tides and currents and generally altered the hydrology, increasing the depth and duration of flooding. Wetland plants must tolerate periodic flooding. When a plant establishes in a well-drained soil the pore spaces between soil particles are filled with oxygen. Upon flooding, however, soil pores become filled with water and respiration of microorganisms uses up oxygen faster than it can be replaced. Thus, flooded soils have little or no oxygen. Plants tolerate such low oxygen conditions by developing special airspace tissue inside the roots called aerenchyma, which creates an internal aeration pathway that allows oxygen and atmosphere to reach the roots. This is one mechanism that allows plants to survive flooding. Although wetland plants are adapted for growth in flooded soils, excessive flooding causes stress and lowered productivity. Over time, the vegetation thins and dies out, leaving ponds that coalesce forming open water behind the spoil banks, which ultimately subside and disappear. Storms and hurricanes can also damage wetlands, causing shoreline erosion, burial with wrack, which smothers vegetation and other impacts. However, hurricanes may also deliver nourishing sediment that counterbalances subsidence. Hurricane Katrina, for example, delivered several centimeters of sediment to coastal marshes, raising soil elevations and reinvigorating marshes. Evidence of sedimentation from prehistoric hurricanes can be seen in cores collected from coastal marshes, indicating that storm sediments have also contributed to accretion in the past. 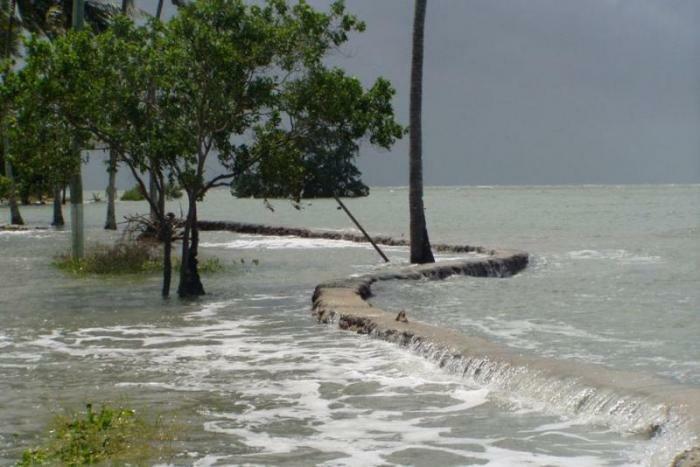 Rising sea level can also bring saltwater farther inland. A common misconception, however, is that all wetland plants are harmed by saltwater. In fact, several coastal plant species are tolerant of sea-strength salinity due to special morphological and physiological adaptations. For example, the extensive salt marshes in the coastal zone are dominated by a plant which grows well in salt water, called smooth cordgrass. Another species common to the coastal fringe is the black mangrove. These species have salt glands in their leaves which excrete salts onto the leaf surface where they crystallize. This is just one of several special mechanisms allowing such species, known as Halophytes, to thrive in salt water. Other species common to coastal marshes have lower tolerances of saltwater. These are found in intermediate and brackish habitats where they grow well under low to moderate salinity levels. The most sensitive plants are found in freshwater wetlands. The species here can be killed by sudden pulses of salt water. However, depending on the duration of exposure and other factors, the community may recover from seeds contained in the seed bank. The causes of wetland loss are complex and not the result of a single factor. Instead, wetland loss is the consequence of multiple interacting natural and human-induced factors, such as subsidence associated with the Deltaic cycle and the leveeing of the Mississippi River, in combination with regional and global changes, such as sea-level rise and climate change. One thing is certain, the Mississippi River Delta is a dynamic system that has undergone dramatic changes over its geologic history and will likely continue to change in the future. The US Army Corps of Engineers and the St. Bernard levee partners are in the process of constructing a new levee system to provide a 100 year risk reduction and to raise the protection level between 26 and 32 feet. 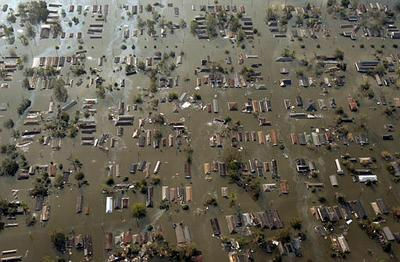 In August 2005, Hurricane Katrina devastated St. Bernard Parish. At that time, the levee had an elevation of 14 to 15 feet. 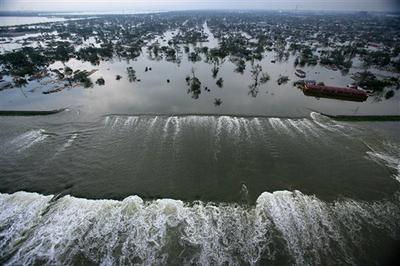 The storm surge from Hurricane Katrina was approximately 22 to 23 feet, which caused a significant amount of water to flow over the levees and flood the parish. 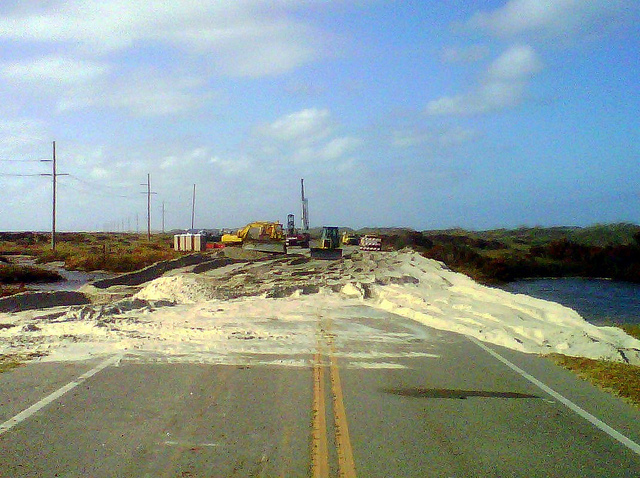 The surge washed away thirteen and a half miles or about 50% of the levees. Today, the St. Bernard levee partners are building T wall levees. The T wall is a concrete and steel structure on top of the existing earthen levee. The top of the levee is cut down wide enough for the base of the T wall. From there, a bower RTG piling rig will drive sheet pile at a depth of 25 to 40 feet. 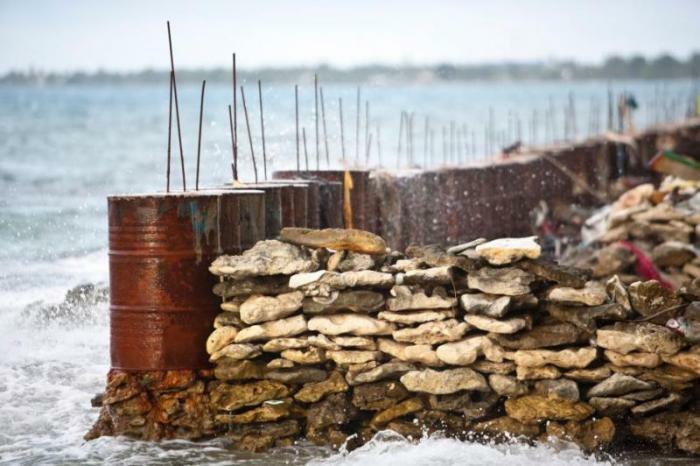 The primary purpose of the sheet pile is to stop water seepage. The construction of the levee has been designed to withstand the subsidence for the next 50 years. Once the sheet pile is driven, H piles are driven to a depth of 90 to 100 feet to support the T wall sections. After the piles are driven, a base slab and wall are poured. The T walls are constructed in 50-foot monolith sections. A monolith is one section of T wall. The levee is designed in a way that the H piles support the footings of the T wall. Theoretically, everything underneath the T wall could wash out and the structure would remain standing like a bridge deck. The rebar is also tied into the footings through a system of stirrups to provide developmental strength in the concrete. The St. Bernard levee partners were given the notice to proceed in February 2010 and are expected to complete the project in June 2011. The design of all of the New Orleans flood protection is based on the elevation of a flood that occurs every 100 years. In other words, there is a 1% chance that the system will fail each year. You might ask why this risk is being taken and the structures have not been built higher. The answer is that it costs a large amount of money to build of the structures to withstand higher water levels. Although New Orleans has received much attention after Katrina, and rightly so, many other areas are also at great risk from hurricane winds, waves and storm surge. One of the most popular holiday spots on the East Coast, the Outer Banks (OBX) of North Carolina, is also highly susceptible to sea level rise. 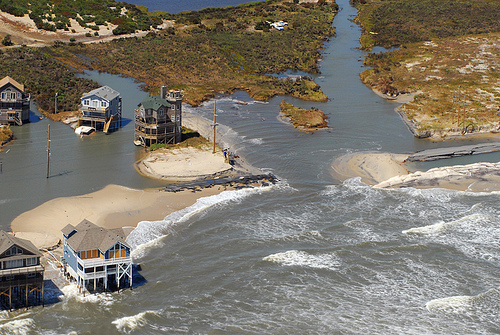 In fact, recent research suggests that the OBX may be experiencing some of the fastest sea level rise on the planet at least as a result of very rapid subsidence of the land. Sea levels in OBX have climbed as much as 3.7 centimeters (1.5 inches) per decade since 1980, while globally they've risen up to 1.0 cm (0.4 inches). 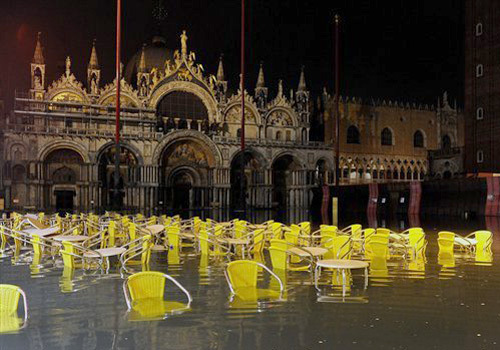 Models suggest that sea level may rise by up to 1.6 meters (5 ft) by 2100! The Outer Banks are part of a chain of barrier islands that stretch from Florida to Massachusetts along the Atlantic seaboard. Barrier Islands are delicate sand bodies that are generally moving towards the adjacent continent as sea level rises; this process occurs largely because storms erode sand from the seaward side of the island and deposit it on the landward side. The OBX is moving at a rate that is quite alarming from a development point of view, a point illustrated best by the famous Cape Hatteras lighthouse. The lighthouse was built in 1870 some 1,500 feet from the ocean. By 1970, the lighthouse was just 120 feet from the ocean, and its fate was not very uncertain. Fortunately, the lighthouse was moved some 2900 feet inland. At the rate the OBX are shifting, all development is threatened. 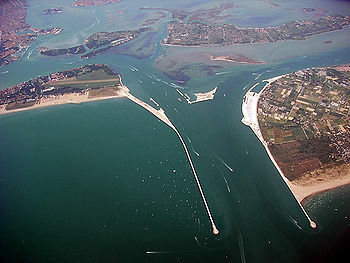 However, development modifies the response of the coastal environment to erosion from storms often increasing erosion rates along the undeveloped parts of the coastline. The OBX are extremely vulnerable to storms as a result of their exposed position in the open Atlantic Ocean, which has led to a greater number of hurricanes. As we have seen, experts predict there will be fewer more powerful storms in the future. The impact of these storms will be amplified by the continuing sea level rise and a powerful hurricane could have an extremely destructive impact on the fragile barrier islands. Load the PSMSL Tide gauge file  in Google Earth. The file shows tide gauge data from around the world which will allow you to explore the rates of sea level rise. The dots show stations organized by the last reported year. Click on stations, and you will see a PSMSL ID number; click on that, and you will get tidal gauge data in mm (for several locations several dots appear; make sure you click on one of the dark green dots). Go to NOAA Sea Level Rise Viewer  and click on Get Started. You will see a map focused on the US which is where we will be working. On the bottom left, please make sure the elevation scale is in meters, not feet. We will look at three different views: (1) sea level rise which allows you to see how the area floods as you move the slider up. (2) Flood frequency which shows the areas that currently flood frequently; and (3) vulnerability, which is a comprehensive assessment on how vulnerable certain regions are to sea level rise (based on elevation as well as population density and demographics such as the percentage of people living under the poverty line). Step 4. Place your video clip at the relevant place in Google Earth by attaching it to a Pin and save as a kmz file (see how-to video on the Capstone Introduction  page).